The Bicentennial Farm Award was presented to Elmer and Carolyn Baer, by Ohio Dept. of Ag Interim Director Tim Derickson (right). 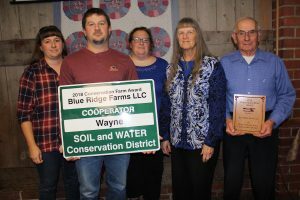 SMITHVILLE, Ohio — This year’s conservation “Cooperator” award winners in Wayne County went to two brothers who run two separate farms, but with a similar approach to conservation. 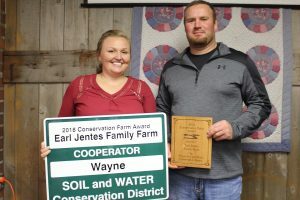 Earl Jentes and his brother, Robert, were both recognized during the annual Wayne SWCD banquet Nov. 8 at The Barn Restaurant in Smithville. The second Cooperator award went to the Earl Jentes family, of Wooster. Earl and his family run 700 acres of crops, including corn, soybeans, small grain and alfalfa. Robert and his family operate Blue Ridge Farms, a 750-acre operation that includes similar crops. Both brothers practice conservation tillage, strip cropping, cover crops, tile drainage and nutrient management. They also both run dairy operations. Robert milks 100 head of Holsteins, and Earl milks 60, and feeds out about 100 head of steers. Robert farms with his wife, Jan, their son, Daryl, and daughter, Sheryl. Earl farms with his wife, Robin, sons Brian and Darren, and daughter-in-law, Lacey. 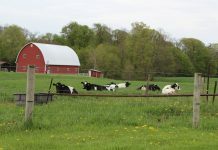 Tim Derickson, interim director at the Ohio Department of Agriculture, complimented the county for its commitment to taking care of the land, in the humble ways that farmers often are known for. The Robert Jentes family received one of two district “Cooperator” awards at this year’s banquet. 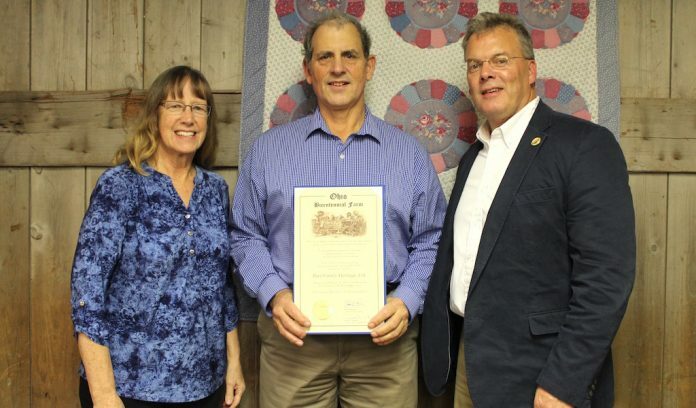 He presented the Ohio Bicentennial Farm Award to the Baer family farm, run by Elmer and Carolyn Baer. 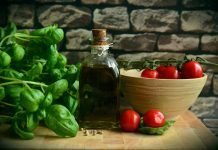 The farm traces its history to 1818, and many of the original farm buildings are still in use, including a bank barn and farm house. 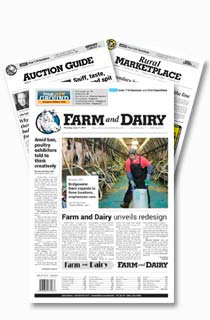 Now in their seventh generation, the Baers operate a 120-cow dairy farm, and three generations of Baer family are still actively involved. The Conservation Education Award went to Pastor Paul Bartholomew, of the Mohican Church of the Brethren. 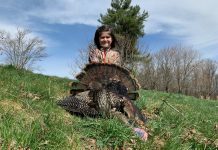 He helps lead the outdoor education program at Northwestern schools, where he teaches youth about the importance of conservation and caring for wildlife. He raises monarch and swallowtail butterflies, and teaches about the importance of milkweed and habitat. During her keynote address, Sarah Jamison, a hydrologist with the National Weather Service, talked about how weather predictions are made. Like farming, she said forecasts are becoming more precise and more accurate, thanks to improvements in technology and data. However, forecasts, like farming, are never perfect. 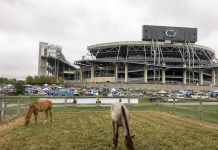 Jamison tries to get it “right,” especially when it comes to weather events that can threaten life and property, like flooding or major wind storms. “Our primary mission is the protection of life and property,” she said. Overall, she expects a colder winter this year than the past few years, but winter does not begin until Dec. 21. Jamison also encouraged landowners to participate in a self-reporting program called CoCoRaHS, which stands for the Community Collaborative Rain, Hail, and Snow network. The program relies on precipitation data tracked by home-based reporters. To learn more, visit https://www.cocorahs.org. Election results. Matt Peart and John Redick were re-elected as district supervisors.